Learn how to set up Address Validation. 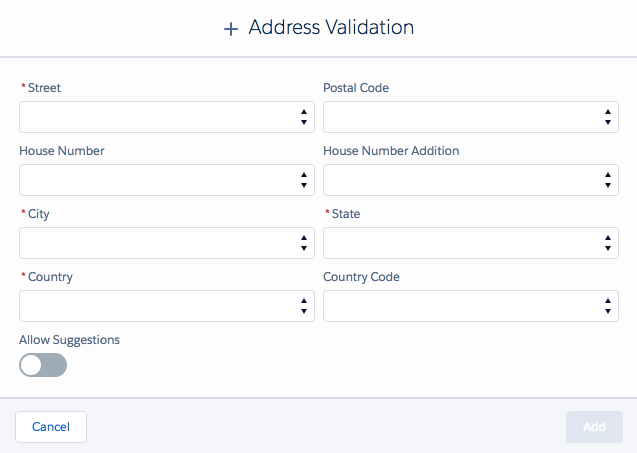 If you want to know how to use Address Validation, please read our Usage Guide. Record Validation automatically configures and maps your standard address fields for the Lead, Contact and Account Object. If you want to adjust your configuration (adding more/fewer fields to your current fieldset) or add a validation for a new set of fields, access the Record Validation Setup page. If you want to use a different set of fields with Record Validation, you have to add a Validation. You can do so by clicking 'Add validation'. Street, City, State and Country are mandatory fields for acquiring a valid validation. Instead of showing field labels, it's also possible to show the fields API names. By allowing suggestions, Record Validation will automatically make suggestions based on your input. When entering "476 5th Ave" as a value at "street address", Record Validation will automatically return potential matches to your query.